FreeOnlineGuitarLesson-Exercise2 Is A Great Chord Theory And Technique Building Exercise. It includes another one of our free video guitar lessons and helps develop your acoustic guitar technique. Expanding your knowledge of guitar chord theory will help you along the road of learning acoustic guitar. This lesson builds on the triads that you learned in FreeOnlineGuitarLesson-Exercise1. 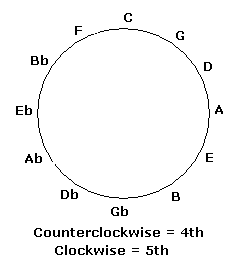 In this lesson we will start with a C major triad and play our way around the cycle of 4ths. Take a look at the Cycle of 4ths Chart. We'll follow the chart in a counter clockwise manner. From C, we'll move to F. From F to Bb, Bb to Eb and so forth. This exercise will help you hear the interval of a 4th. Of course, as you arpeggiate each triad, you'll be hearing the difference between roots, 3rds and 5ths. Guitar chord theory isn't the only thing that you'll learn in this lesson. FreeOnlinGuitarLesson-Exercise2 should also help you develop your physical skills. You'll become more familiar with the fingerboard and your left hand will stretch while you're playing the triads. You should also work at each note having the same volume and not having much, if any, fingernoise when you switch chords. You can find the tab for this lesson here. If you have any questions or comments about this lesson, you can contact me. Leave FreeOnlineGuitarLesson-Exercise2 and return to learn-fingerstyle-guitar.com .